[PDF] Concepts, Syntax, and Their Interface: The Theta System (Linguistic Inquiry Monographs) | Free eBooks Download - EBOOKEE! Description: One of Tanya Reinhart's major contributions to linguistic theory is the development of the Theta System (TS), a theory of the interface between the system of concepts and the linguistic computational system. Reinhart introduced her theory in a seminal paper, "The Theta System: Syntactic Realization of Verbal Concepts" (2000) and subsequently published other papers with further theoretical development. Although Reinhart continued to work on the Theta System, she had not completed a planned Linguistic Inquiry volume on the topic before her untimely death in 2007. This book, then, is the first to offer a systematic exposition of Reinhart's Theta System. The core of the book is Reinhart's 2000 paper, accompanied by substantial endnotes with clarifications, summaries, and links to subsequent modifications of the theory, some in Reinhart's unpublished work. An appendix by Marijana Marelj discusses the domain of Case, based on an LSA course she taught with Reinhart in 2005. 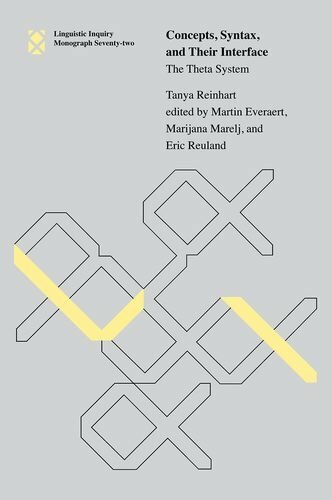 Two additional essays by Reinhart's linguistic colleagues discuss the division of labor between the lexicon and syntax and the apparent conflict between the Theta System and Distributed Morphology. No comments for "[PDF] Concepts, Syntax, and Their Interface: The Theta System (Linguistic Inquiry Monographs)".